Thanks to the Rocky Mountain Climate Organization! Water and Birds in the Arid West: Habitats in Decline is intended by the Audubon Society to be the first comprehensive assessment of the complex and vital relationships that exist among birds, water management, and climate change in the Southwest, focused on two of the most imperiled and irreplaceable western ecosystems: the Colorado River Basin and nine saline lakes, including the Great Salt Lake and Salton Sea. Species particularly at risk are identified, as well as recommendations on finding sustainable ways for people and birds to use water and coexist in the West. Global warming will devastate marginal farming areas, Summit County Citizens Voice, July 15, 2017. MIT researchers model how climate change will affect the water available for irrigation in river basins nationwide, and conclude that by 2050 under a business-as-usual scenario, several southwestern basins will see existing water shortages “severely accentuated.” They project Arizona cotton production and Utah maize production will drop to less than 10 percent of the crop yield attainable under optimal irrigation conditions. Extra-windy March boosts wind, solar power’s share of Colorado’s energy to 24 percent, Denver Post, June 16, 2017. The percentage of Colorado’s electricity from solar and wind in March was well above the roughly 18 percent rate the state achieved for 2016, eighth best among states. The Colorado Energy Office says the state’s electric utilities are generally on track to meet the state renewable energy standards for 2020 — 30 percent for investor-owned utilities, 20 percent for rural electric cooperatives, and 10 percent for large municipal utilities. Politics and Global Warming, May 2017, a poll conducted by the Yale Program on Climate Change Communication and the George Mason University Center for Climate Change Communication, shows that three-quarters of Democrats, just over half of independent voters, but only one-quarter of Republicans think that climate change should be a high priority for government. Carbon farming: California focus on soil to meet climate, water goals, Water Deeply, July 31, 2017. California’s Department of Food and Agriculture leads a new collaborative program called the Healthy Soils Initiative, which promotes (including grants to producers) innovative farm and ranch management practices that contribute to building adequate soil organic matter that can increase carbon sequestration and reduce overall heat-trapping gas emissions. Berkeley Laboratory’s annual status report provides an overview of key trends associated with state renewable portfolio standard policies. The report describes state goals, key policy design features, compliance with interim targets, past and projected impacts on renewables development, and compliance costs. See also 50% rise in renewable energy needed to meet ambitious state standards, Inside Climate News, July 27, 2017. PipeX workers install purple pipes for non-potable, recycled water for irrigation at DCIS at Ford on July 12, 2017 in Denver. 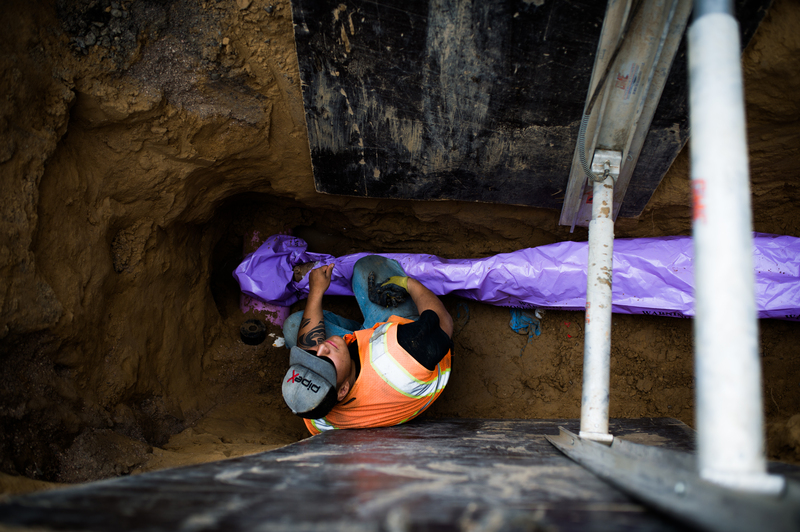 Informally dubbed the “Purple Pipes Project,” using non-potable water for irrigation will save the city $320,000 per year after this summer. Denver Water is asking for state permission to expand the uses of recycled water — to include flushing toilets in commercial buildings, washing cows and pigs at the National Western Stock Show, and irrigating crops such as marijuana. “We’re as much about water conservation as anyone else,” CDPHE director Larry Wolk said. “If there’s reuse potential for that kind of water that doesn’t pose any type of health risk — or has an acceptable health risk — then it is something we definitely should consider. “We won’t know until that technical assessment is complete if it is an acceptable risk or not. Just because it was OK in 1980 doesn’t necessarily mean it is OK today — because we know a lot more, after nearly 40 years, than we knew then,” Wolk said. Employees push cars through at Water Works on July 11, 2017 as customers drop them off to get washed. Water Works, which recycles a percentage of its water already, can wash as many as 400-500 cars a day. All the water used to wash the cars is collected in the pit and pumped through the filtration system. Fresh water is used to rinse the cars off and is reclaimed as well. The 80 current users of recycled water include irrigators and industrial plants, nine schools, 34 parks, five golf courses and the Denver Zoo. The Denver Museum of Nature and Science uses recycled water to run heating and cooling systems. Xcel Energy’s Cherokee power plant uses about a third of Denver’s recycled water. Colorado’s state water plan calls for increased use of recycled water to conserve supplies. The plan sets a target of cutting annual water consumption statewide by 130 billion gallons — because population growth and development is straining supplies. It urges increased recycling of water to prevent destruction of rivers with a target of reusing 19 billion gallons a year by 2050. State water conservation board members have approved use of funds to develop smart regulations. Denver City Council members also are interested, considering proposals to redirect “graywater” from showers and washing machines to flush toilets and irrigate gardens through subsurface drip systems. This household wastewater has not yet moved into sewers — different from the recycled water that Denver Water treats and circulates through the purple pipes. Recycled water, because it once contained urine, holds salts that are costly to remove — requiring treatment processes that would clean the water to the point it could be deemed safe for people to drink. Some Denver residents complain that recycled water used to irrigate parks may be killing pine trees. And Denver Zoo officials, able to use recycled water for animals, have had to make fully treated drinking water available for elephants to drink to comply with national zoo standards. California, Florida and Idaho already have adopted health regulations allowing use of recycled water for toilet flushing and to irrigate food crops, according to a recent Western Resource Advocates review. PipeX workers install purple pipes for non-potable, recycled water for irrigation at DCIS at Ford on July 12, 2017 in Denver.